Top waterside dining in Sussex. Restaurants, pubs and cafes with sea, river and lake views. Eat alfresco - or safely behind windows. 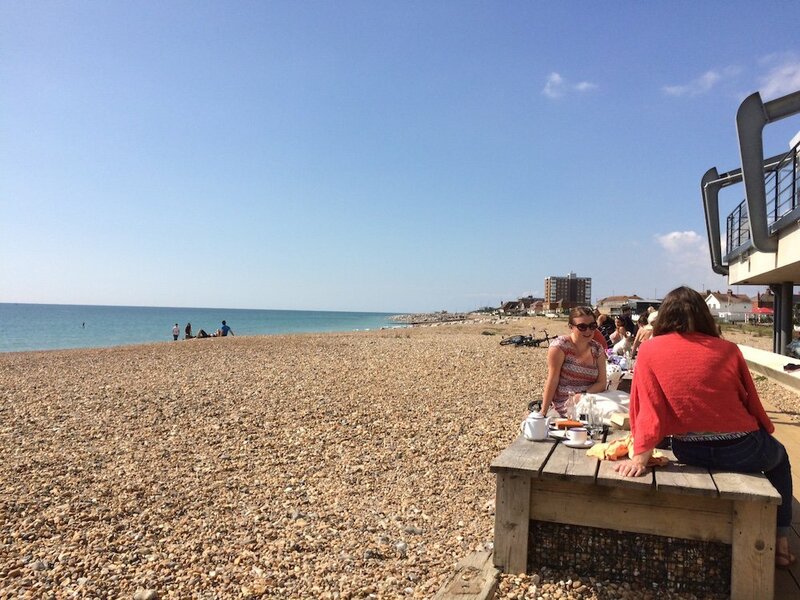 Indulge in a spot of waterside dining in Sussex at these eateries by sea, river and lake with indoor as well as al fresco views (less danger of seagulls nicking your chips). 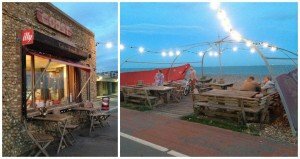 This great cafe/restaurant is right on the beach at Lancing, with plenty of benches to eat outside and large glass window giving views from the inside. Midway between Worthing and Brighton it’s a favourite Muddy bike ride stop, there’s also a playground, public exercise machines and grass for a kick about nearby. Families, cyclists, dogs and more join the gaggle in and around the cafe. The cakes are always tempting and Magnum lollies are usually sold for £1. The restaurant serves up fish and chips, moule frites, burgers, bowl food and more. Best of all there’s a cracking roast 4-7pm on Sundays with impressive sharing boards. It’s an eco-friendly building as well. Big Muddy thumbs up. Yes it has a deck and yes, it’s on the beach. I’ve had a very good Moules Frites here and a heavenly meze platter starter with homemade hummus and beetroot dips. 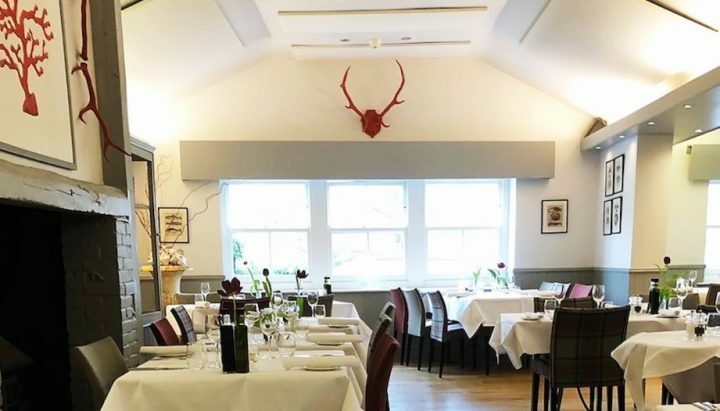 They also serve the likes of battered fish and chips, burgers and meatballs and if you want to posh things up, the wine list includes champagne. The cakes also looked divine so you can just pop in for a cuppa. Children’s and gluten-free menus are available. It was sunny but blowing a houlie when I was there but the large alfresco area was still packed (you can reserve inside tables at least). Dogs are welcome inside till noon and outside at any time. There’s a fun kids’ playground with water features next door. 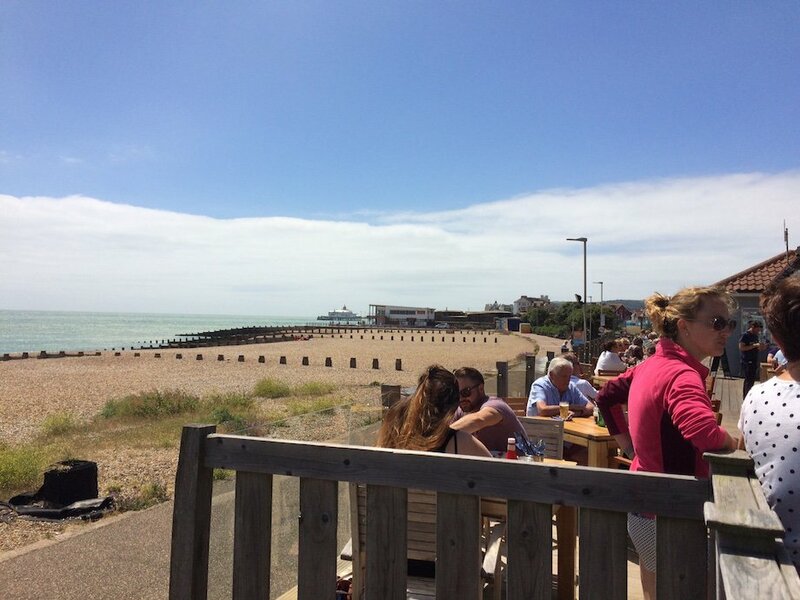 This is the only cafe right on Worthing’s beachfront, a short stroll from the pier and Pavilion Theatre, and it’s a cosy grotto-like stone building with a deck area on the pebbles for when the weather’s playing ball. In the mornings (9.30 – noon) they serve up full Sussex breakfasts, free-range sausage sandwiches, chestnut mushrooms on toast and more. For lunch devour the likes of mixed fish mezes and organic Sussex burgers, plus homemade soup and Welsh rarebit with salad. There’s also a children’s menu including indulgent hot chocolate, and wine, beer and cider for the grown-ups. You can linger into the evening on weekends with booze and nibbles till late and there are often bands. See my review from a winter visit, pre recent expansion, here. Not quite so on the beachfront but very close by and well worth checking out is cool seafood hangout CrabShack. 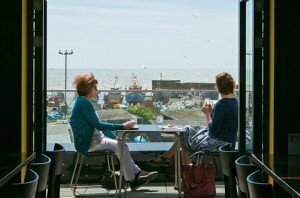 The cafe at the Jerwood has an outdoor terrace with views over the Stade and beach where the fish on the seafood-heavy menu was landed by Hastings’ fleet. Lunch simply on crab sandwiches and chips or push the boat out with a seafood board with squid, soused herring, mackerel pate and more. Meaty options include the likes of pulled pork and bramley bap while veggies can have a mediterranean board or sweet potato and chickpea cakes. There’s a snacks and a comfort food menu from marmite fingers to macaroni cheese for the under 10s and a selection of cakes if you’re after a quick pitstop. Webbe’s Rock-a-nore restaurant is just across the road. A Muddy Stilettos Awards finalist and a rare opportunity for fine seaside dining on the front at Brighton. It bills itself as a ‘champagne & oyster bar’ but don’t be put off if, like me, oysters make you heave as there’s plenty more fishy fare besides including half pints of prawns, mixed shellfish mariniere, fish pie, fish curry, catch of the day, up to the more indulgent wok fried crab, whole lobster and fabulous sharing platters. Vegetarians also have a few choices. It’s a great option for treating visitors to the coast and the weekday set menu is good value. 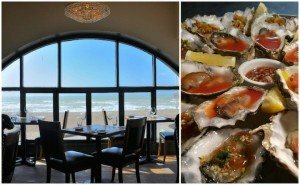 Nearby, check out the new contemporary Belle Vue restaurant under the i360 which also fronts the beach. 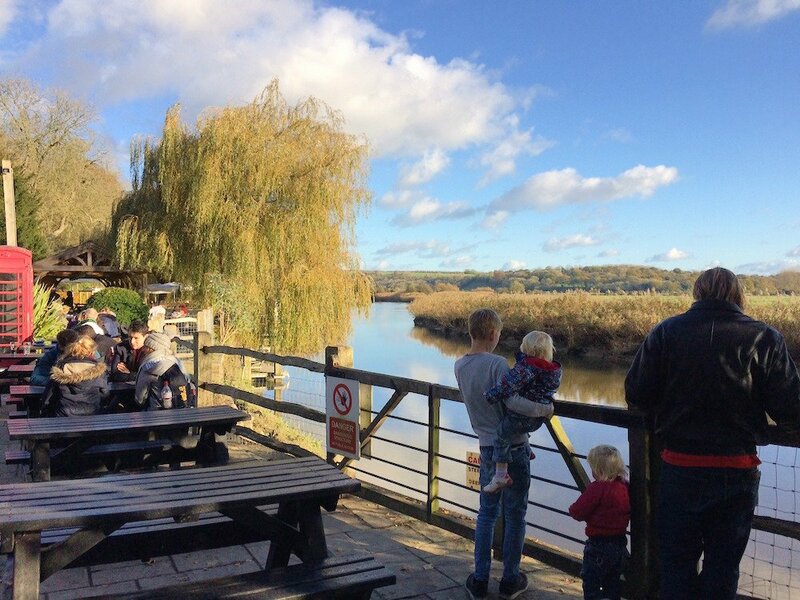 Not only do you have the chance to spy waterbirds and voles out and about by foot or boat safari at this family-friendly centre but you also overlook the River Arun from the glass-fronted cafe. There’s hot and cold food, cakes, booze and hot drinks including a current marshmallow hot chocolate. The profit on what you buy goes towards helping conservation. Play areas, pond dipping and plenty of seasonal activities, especially in the school holidays, keep youngsters amused around the site. 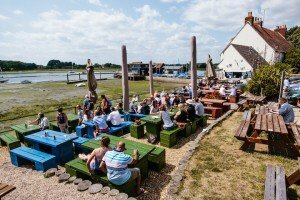 This 16th century pub on Chichester harbour, has a daily menu dictated by what the local boats have landed that morning, from Dover sole to lobster. Sunset sessions in the summer see Ibiza-style music, sundowners and a BBQs outside. Coming up on 4 Oct is a specially priced ‘Locals’ night’ menu with the likes of Selsey crab bisque, gin cured sea bass, Chichester mullet, venison burgers and a sharing chocolate fondue. Looking for something more cake, paninis and coffee? Try the dog-friendly Quarterdeck Cafe at Itchenor Shipyard. 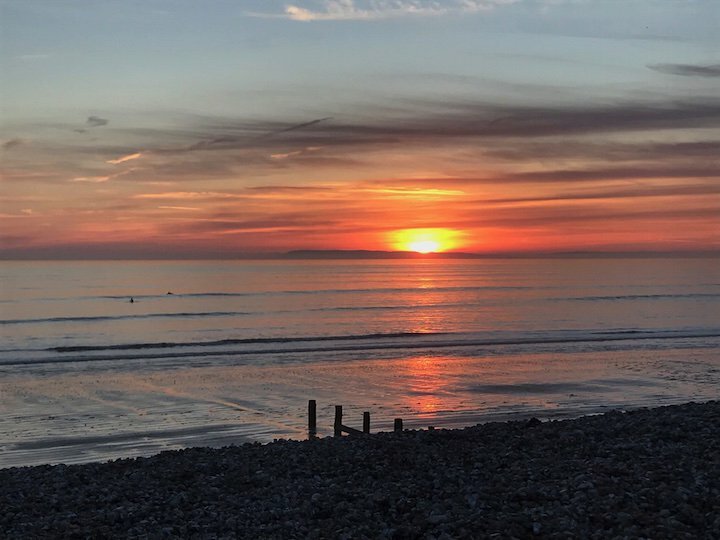 A seaside cafe near East Wittering with views to the Isle of Wight, It serves up breakfasts and brunches (hearty, fishy or oaty), lunches, sundowners and pop-up evening events. 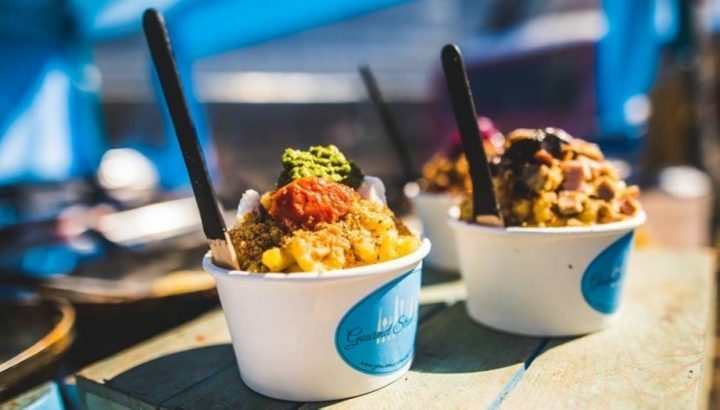 Tackle a toastie, burrito, burger, salt and pepper calamari or seafood platter by day or indulge with an icecream sundae or a cocktail. Linger over full meals Thurs, Fri and Sat evenings. On Fridays from 5.00pm choose Fish & Chips or a bowl of fresh Moules Frites paired with a glass of wine or a pint of local ale for £10.95. Locals’ nights with set three course menus run from late September. 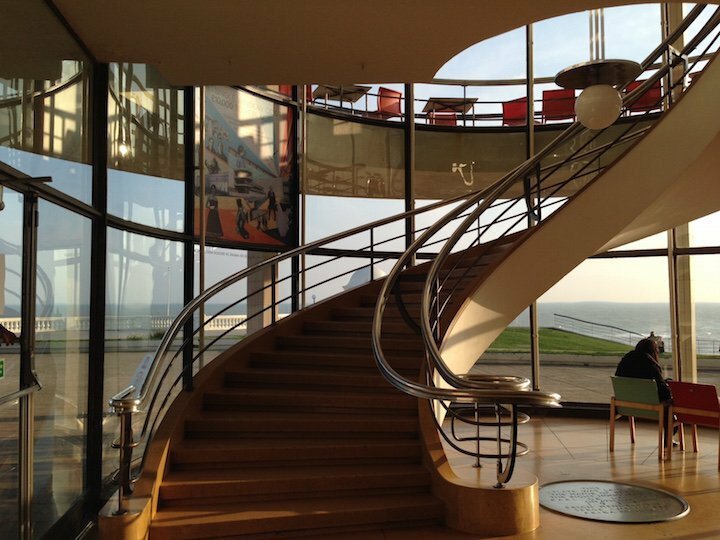 Bexhill’s restored Modernist De La Warr pavilion is beautiful in its own right but you can also get a lofty seaview from the second floor cafe. I find it rather pricey for a basic lunch so it’s best offset with a free exhibition but it does use quality locally sourced ingredients. It’s open until 5.00pm for homebaked bread, cakes and pastries, breakfast, lunch or ‘linner’ and Sussex cream teas. Children’s mini meals are also available. Be warned weekend lunchtimes can be rammed. I’ve highlighted these lovely Littlehampton sister cafes before, both designed by notable architects. The smaller, West Beach Cafe at the lesser frequented of the beaches has a hinged window front that can open and close and a vantage point over the river mouth and sea. It does breakfast baps, beer battered fish and chips, scampi, homemade fishcakes, salt and pepper squid and fried halloumi for the veggies and is licenced and available for party hire. The larger East Beach Café on the main beach resembles (in theory at least) a giant piece of driftwood. The menu includes traditional fish & chips with pea puree, burgers, soup, seafood platters and pasta. An historic pub on the river Arun, with knockout castle views on the doorstep to boot. The traditional pub grub includes an award-winning steak and ale pie and hand carved ham and eggs and ingredients are sourced regionally, typically from family businesses. There’s 150m of riverside seating including on a terrace, and a playground and kids’ menu will keep youngsters happy. 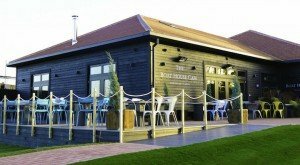 This casual dining restaurant on Chichester’s marina uses seasonal produce from West Sussex, Hampshire and the New Forest and coffee from a boutique supplier. Have breakfast, brunch (how does warm waffles, or chorizo and potato hash sound for comfort food?) or lunch by the water, or turn up in the evening for the bistro menu which may include steak burger, ale-battered fish and chips and tiger prawn linguini and indulgent deserts like warm pineapple cake with rum and raisin ice-cream. There’s also a Little Skippers kids’ menu. Elsewhere in Chichester on selected dates from April you can take a fish and chips cruise on a barge down the canal. Up by the Kent border, Bewl Water has a couple of new eateries with reservoir views. The Waterfront Restaurant and Cafe serves up free range sausage and mash, soup, sandwiches, kids’ lunch boxes and a range of specials. The Bistro menu currently includes slow cooked pork belly and pan fried Bewl Water rainbow trout. It also offers afternoon tea with finger sandwiches, homemade scones, cakes and pastries accompanied either by a selection of teas or Prosecco and if it’s warm enough you can sit on the balcony. 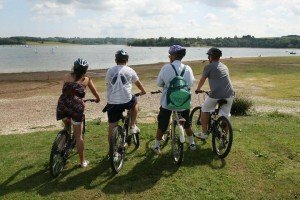 Earn your indulgence with canoeing, rowing or sailing on the lake, cycling or nature walks, or take a ferry ride. There are extra activities for children in the holidays. 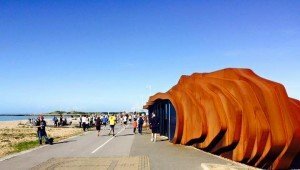 Got a Sussex waterside favourite that’s not on my list? Please share in the comments box – knowledge is power peeps! Thank you Helen, so lovely to hear you’ve acted on some of my suggestions. For a piece like this it’s a combination of places I know well, recommendations and research. Hi, You must take a look at HAWKHURST FISH FARM, it has everything you would wish for from lunch to tea, also on the site there is a delightful barn where you and the children can paint pottery, do a collarge or design the coloring of paper mache animals etc. Hi Margaret, ah that looks like its just over the border in Kent, I will alert Muddy Kent too. Sounds lovely, thank you for the tip!